Thank you for sharing your heart with us and your concern over what we are teaching about grace. Your concern has definitely been heeded and respected. We greatly value your fellowship in the faith and love you too. I am so blessed to know you! I'd like to share with you my thoughts on David's blog post, as well as a bit more about my background. It is important that you know where I come from. I grew up in a home that I would describe as conservative Pentecostal, that is, both my parents speak in tongues, sing and dance in the Lord with great joy, engage in spiritual warfare, but yet never fell trap to any of the extreme Pentecostal trappings that many Pentecostals often do (as in the experience which you shared with us the other night). My memories of home are wonderful, and I thank God for my upbringing. My parents have always been steadfast and joyful examples of faith in God for me and my siblings. So that is the environment I grew up in. When I became passionate to serve God in my late teens, my parents gave to me a book by Leonard Ravenhill which had a profound influence on my life. In Ravenhill's characteristic way, he chastised the modern church for its laziness and sinfulness and contrasted it with the Book of Acts and other people throughout church history who lived radical lives for God. I was stirred. That is what I had been feeling about the church, questioning why there was such a difference between it and the church I read about in the Book of Acts. I did a search for Ravenhill online and that led me to Sermonindex. I was amazed at the teaching and sermons on that site, and daily took in as much as I could. Sermonindex was the site I spent the most time on for several years. I loved listening to men speak with passion about knowing God intimately and serving Christ boldly. I had never heard preaching like that in the church that I grew up in. I was also blown away by the accounts of revivals in various places (Hebrides, Wales...). I wanted to see revival happen in my own hometown and took up these men's challenge to pray and to labor for it. I started boldly preaching on the streets and challenging others to live their lives for God. I was invited by Greg Gordon to visit him in Toronto in 2006 (he got to know me through Sermonindex as well as through my blog where I would write posts about revival and Christianity and share about what I was doing on the streets). We bonded, and ever since then he and I have had a pretty close relationship, involving traveling together and living together. I count Greg as a very dear friend whom I love very much. I helped Greg (in a small way) organize and run the first and second Revival Conferences in Canton, Ohio, and Greenock, Scotland. We also lived together in Victoria, BC, for a summer, just he and I, and spent lots of time witnessing on the streets. Greg lived for a while in New Brunswick, Canada, in my hometown, spending time with my family. I saw him when I would visit home. He has even visited me in Logan and hopes to do so again sometime. I'm telling you this just so that you know how deeply involved I have been with Sermonindex and Greg's ministry. If you look, you'll even find that I am a speaker on Sermonindex (see under Audio Sermons by Speakers, Other Speakers A-F). I met David Ravenhill and his wife at a wedding which he was conducting for one of my friends. 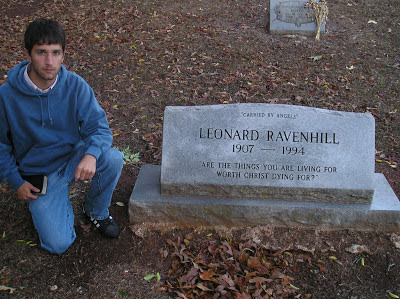 I visited Leonard Ravenhill's grave in Garden Valley, Texas, in reverent awe. I read most of his books and others that he recommended (in fact, most of my earlier library was filled with books somehow related to Ravenhill). I considered him a standard. You can go to the earliest posts on my blog and learn about me from those early days. You'll see how much I was influenced and involved in revivalism. I'd like to tell you what was going on with me on the inside during that time. Through the revival teachings of Sermonindex I became a person who outwardly looked very good, but who inwardly was very ugly. Inside I was full of pride, selfish ambition and envy. But on the outside I was angelic, appearing very humble and giving all glory to God. I was also full of lust and had no self-control. But outwardly I passed as someone who was a hard-liner against sin and who was passionate about holiness. I was judgmental towards other people, both Christian and non-Christian, thinking that I was better somehow because I knew the truth and was working to be part of the solution. I prayed much, and the more I prayed the more I felt that I was closer to God than others. I remember saying lots of critical things about the idea of grace and about people who believed in it. To me, they just wanted to sin and didn't want to carry the rugged cross of holiness. Of course, I wasn't carrying it myself, but at least I wanted to, and at least I was preaching it, right? I really thought that I was doing God's will and that God was on my side. I remember thinking one day at a church service where people were rejoicing in the love of God: "Why are they so happy? I'm the one who's doing all the work. These people don't even do what I do." I also felt competitive with other young people who were zealous for God. I would read on Sermonindex what they had been doing and felt that I needed to do something like that too. I liked posting my exploits for others to see; but all the while I was doing it under the sincere conviction that I was godly and was really serving God. I cannot emphasis enough how spiritual I looked on the outside. My best friend Miles, when I told him a few years ago that I wasn't a Christian during those days, was amazed. He said that he had sincerely thought that I was "one of the most spiritual people that he had ever met." I had fooled myself as well. What I want to tell you is that I wholeheartedly followed Leonard Ravenhill and the other revivalist's advice about getting down to business with God, and I had born the sour fruit of that teaching. Those ugly things were inside me, but they were fruit. I truly wanted to serve God... I really believed in Him - but the course I took was not grace but works. Paul warned us that the way of flesh produces the works of the flesh (Gal. 5:19-21), and I experienced it. I didn't want to sin and be proud, but I couldn't help it, because it was all about my works for God. "The church is a mess because Christians are lazy. Who will rise up and get with it?" "God wants to bless you with the Spirit and revival, but you have to pray and deal with your sins." Revivalist teaching is not about grace. The cross of Christ has very little place in it except to bid us come and die. All the sermons, while they can be beautifully delivered and can shine up the attributes of God, always ultimately end up being about you and what you need to do. While humility and holiness is always held up and highly sought, there is very little of it at all to be found among those who preach and listen to revivalism (though there is a lot of appearance of humility). Revival messages are all about how "if God's people, who are called by His name, will humble themselves and pray, and seek His face, and turn from their wicked ways, then God will hear from heaven and forgive their sins, and heal their land" one way or another. However, that is not the gospel. While revivalists sincerely want to see God move and to have intimacy with Him, they fail to realize that in Christ God has moved in the most marvelous way which will never be repeated, and that it is the glorified Savior that draws people to God for intimacy, because intimacy with God is based upon faith in the Son who reveals the Father, and not in our own works and mystical experiences. I have been there and done that. I know what it is to be on either side. I know what it is to be seeking revival, and I know what it is to be glorying in Christ. Today, I don't feel like there's a big difference anymore between what I believe and experience and what the church in the Book of Acts believed and experienced. I find myself relating to them more and more, rather than just always pointing out the chasm. They understood the gospel and were excited about it. I have come to understand it too, and it is far more exciting and beautiful than anything I ever knew. I'm not interested in a mystical experience in order to "know God personally", because I now know God personally through faith in Jesus Christ. He loved me and gave Himself for me! God does not need to validate His love for me in constant religious experiences because He "demonstrates His love for me in this, that while I was yet a sinner, Christ died for me." (Rom. 5:8) This is the verse that granted me peace when I was in dread and despair in 2007 because of my hypocrisy and sin. The truth set me free. I at last came to rest from my own works and found joy and peace in His grace. Grace is really what the Bible is all about. Of course, grace is a loaded word, and it carries with it all the glorious truths of righteousness and the incomprehensible love of God. Christianity is not about having a relationship with God that has to do with working in order to be on God's good side in whatever way. It is about believing that His favor has been given undeservedly in Christ, and enjoying it, finding all of our strength in the peace and joy that He has provided. I can honestly say that things changed in my life, both inwardly and outwardly, since I put away the revivalists teaching and turned to the teaching of God. The fruit has changed. I no longer feel like a hypocrite. While we all sin when we take our eyes off of the blessed truth of Christ, I am no longer enslaved to sin like I used to be. That judgmental, selfishly ambitious, lustful and ugly person that I used to be is gone. It is the power of God's good news that has changed me, not my willpower and my efforts like it used to be about (though I used to say that it was all about God's power in those days). How blind I was, but now I see! I disagree with David Ravenhill's blog post. It was to give us freedom that Christ died, but in David's scheme there is no freedom, because a little leaven leavens the whole lump. If I am not free from the condemnation of all my sins, past, present and future, then I am not free. What else did Christ die for? What other freedom could it have been? It wasn't political or physical, but moral. I am no longer under the responsibility to pay for my sins, and that is the truth. But this truth does not lead me to sin, as Ravenhill is suggesting. The gospel truth is not simply that I am free from condemnation, but that I am loved by God who has manifested His love by freeing me from condemnation. My freedom is a manifestation of His love. In this light my freedom becomes a powerful motivation to serve God, because "we love Him for loving us first." (1 John 4:19) There can be no true service towards God unless it is from the source of love for God, but there can be no love for God without the love of God; and there is no love of God that the New Testament knows apart from the love of God that frees us from the condemnation of all our sins. "In this is love, not that we loved God, but that He loved us and gave His Son to be the propitiation for our sins." (1 John 4:10) Paul found his whole motivation for the Christian life here: "The life that I now live, I live by faith in the Son of God who loved me and gave Himself for me. I do not frustrate the grace of God: for if righteousness comes by the law, Christ is dead in vain." (Gal. 2:20-21) It is not good when Christians seek holiness in order to be in the right condition with God to obtain His blessings rather than for the sake of holiness itself, which is simply love for God and man. This love can only be in our hearts by the gospel. The problem with what David is saying is that he is divorcing the freedom from the love, and then criticizing the freedom. Yes, people will sin when they think in terms of freedom without the love of God. But what then is the solution to their sin problem? Take away the freedom? No! Preach the love of God! The revivalists are correct in that they point out that there is a problem in the church today. They rightly see that the church today doesn't look like the Book of Acts. But they wrongly diagnose and thus they administer a false solution. They think the problem is grace, and their solution is legalism (put bluntly, for they wouldn't say it like this). However, the problem is not grace, but counterfeit grace. The problem is "grace" divorced from Christ, which is not grace at all. Guilt-tripping and working harder for God is not the answer. The answer is seeing Christ in all His glory and grace. That is where the power to save and transform lies. I don't believe the devil is like he is describing. That's just not the picture we get of him in the Bible. He preaches "righteousness" (2 Cor. 11:15). He blinds men from seeing the glory of Christ (2 Cor. 4:4). He stands opposed to Jesus by the spirit of legalism (see the Pharisees). He deceives men into doubting the loving character of God (that's what the serpent in the Garden of Eden did). Remember that the Pharisees, who were the children of the devil, believed in losing one's salvation by sinning, and taught people not to get drunk and not to fornicate. I found David's teaching to be typical of revival teaching, shallow and missing the deeper thing: the gospel. While I am sorry that it took me so long to understand the gospel of grace, and that I undoubtedly hurt myself and other people along the way, I am thankful to God for the experience that I had in revivalism, because it has made me far more sensitive to these issues and has also freed me from the attraction of the impressive. If there is anything about the revivalist preachers, it is that they are impressive. Their preaching is impressive, their praying is impressive, and their zeal is impressive. But so much of that is of man; man impressing man, and zeal without knowledge is deadly. I have since learned that nothing that I do is of any spiritual value before God to get His blessings, but that only Christ is valuable. In Christ I am blessed with every spiritual blessing (Eph. 1:3), and in Christ all the promises of God are "yes" and "amen" (2 Cor. 1:20). "But what things were gain to me, those I counted loss for Christ. Yea doubtless, I count all things loss for the excellency of the knowledge of Christ Jesus my Lord, for whom I have suffered the loss of all things, and do count them but dung, that I may win Christ, and be found in Him, not having my own righteousness which is of the law, but that which is through the faith of Christ, the righteousness that is of God by faith." (Phil. 3:7-9) If righteousness brings life, then in Christ I have life. The necessity of the times is to see that Jesus Christ is sufficient. May God bless you, L-----, with this vision. Thank you again, sister. Thank you Eli for sharing. "if God's people, who are called by His name, will humble themselves and pray, and seek His face, and turn from their wicked ways, then God will hear from heaven and forgive their sins, and heal their land"
Good thoughts, bro. Thanks for the encouragement. I realized after spending some time in Romans 2 that I am applying the Law to a co-worker while enjoying God's grace in my own life. What a hypocrite I am! Thank God that I am not God...and that He already bore the penalty for my human unkindness, so I can be free of it! Amazing love, indeed. I've just come across your website. I found this post very insightful. I too have been troubled by some of the theology of revivalism. This article was a breath of fresh air. Thank you.